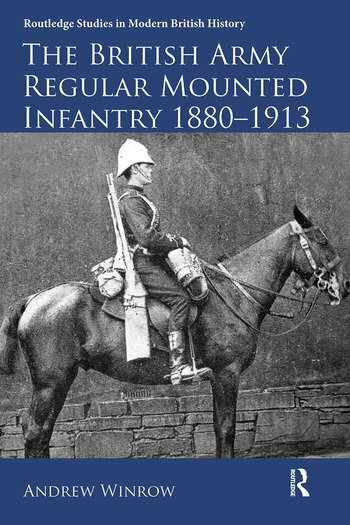 The regular Mounted Infantry was one of the most important innovations of the late Victorian and Edwardian British Army. Rather than fight on horseback in the traditional manner of cavalry, they used horses primarily to move swiftly about the battlefield, where they would then dismount and fight on foot, thus anticipating the development of mechanised infantry tactics during the twentieth century. Yet despite this apparent foresight, the mounted infantry concept was abandoned by the British Army in 1913, just at the point when it may have made the transition from a colonial to a continental force as part of the British Expeditionary Force. Exploring the historical background to the Mounted Infantry, this book untangles the debates that raged in the army, Parliament and the press between its advocates and the supporters of the established cavalry. With its origins in the extemporised mounted detachments raised during times of crisis from infantry battalions on overseas imperial garrison duties, Dr Winrow reveals how the Mounted Infantry model, unique among European armies, evolved into a formalised and apparently highly successful organisation of non-cavalry mounted troops. He then analyses why the Mounted Infantry concept fell out of favour just eleven years after its apogee during the South African Anglo-Boer War of 1899-1902. As such the book will be of interest not only to historians of the nineteenth-century British army, but also those tracing the development of modern military doctrine and tactics, to which the Mounted Infantry provided successful - if short lived - inspiration. Andrew Winrow undertook a Masters’ degree by research in 2010 and completed a DPhil in 2014, both in Victorian military history, at the University of Buckingham. He is a member of the Victorian Military Society and was awarded the Society’s Howard Browne Medal for 2014. His research interests encompass aspects of the late Victorian and Edwardian armies and he has published articles in several military history journals. Dr Winrow is a full time NHS hospital consultant working in London.